Chia seeds are tiny power-packed seeds that have been documented to be around since 3500 bc in the diets of Aztecs and Mayans. They had identified that these super seeds had the ability to increase stamina and energy over long periods of time. 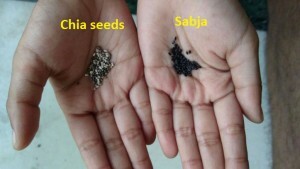 What is the difference between chia seed and sabja seeds (basil seeds)? 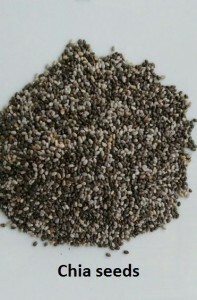 Chia seed is a native of Mexico and it does not have an Indian name. However, it has time and again been confused with basil seeds which are also known as Sabja in Hindi. Be it in appearance, origin or health benefits; Chia seeds are different from Sabja in numerous ways. Both chia seeds and sabja seeds originate from the mint family and hence the resemblance. 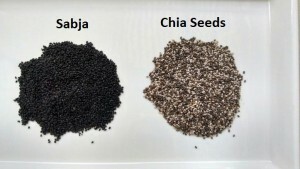 Chia seeds are native to central and southern Mexico while Sabja seeds are native to India and the Mediterranean region. 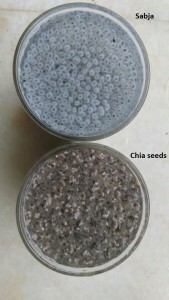 As can be seen in the above image, the left side is CHIA SEEDS. They are usually a mixture of grey, black, white and sometimes even brown seeds. However, even the black ones are not pitch black in colour. Instead, a dull pattern or a mosaic is visible on them. On the right side is SABJA SEEDS, uniformly jet Black in colour. Chia seeds are oval in shape and Sabja seeds are elliptical, like tiny grains of rice. Chia seeds take time to absorb water. It has the unique ability to gel by absorbing over 10 times their weight. Sabja seeds swell up within seconds of being mixed with water. A translucent coat forms around the seed and it appears much larger in size when compared to a soaked chia seed. Chia seeds do not have any taste of its own and can easily be incorporated in any kind of dish. Sabja seeds have a mild flavour of basil and impart the same to drinks and desserts. Chia seeds can be consumed raw or soaked. Sabja seeds can be consumed only after soaking. Both, Chia and Sabja seeds have their own set of health benefits. They have been known to aid in weight loss due to their ability to make you feel fuller faster. Here are the most beneficial properties of the seeds. Usage/Health Benefits Can be consumed raw or soaked. Good source of proteins and Omega 3s Can be consumed only after soaking. Has a soothing effect on the stomach and hence useful to combat acidity. *Chia Seeds from Naturally Yours is now available on GOQii Store. in our daily diet can make a huge impact on our overall health. Thanks for this blog. Good one! 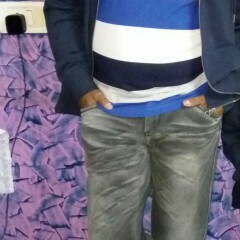 Dear Parkash I liked your effort, I being a Nutro-Pharmacist, found your blog very helpfu. I would like to be intouch with you for a similar project, for organic farming and its consumption. But you said Chia does not have an Indian name, this is NOT correct. Its Indian name is halim in hindi and aliv in marathi. It’s been in our culture for centuries. I have had it post pregnancy , which is said to be very good. Thank you very much for this blog. I live in Mexico, here we use a lot chia for omega 3. I heared about sabaja seeds for new pains. Especially was searching for difference and found this blog. Really great work from you, very useful . I wanted to ask, how many time’s their weight do Sabja seeds absorb water? If u try n compare the dry size and soaked sizes after a few hours then the Sabja seeds appear a little larger. Just from observation it seems that they could absorb even more than 10 times their weight in water making them even better than Chia in that aspect. It is a very useful page. I got the clear idea about both seeds. Thanks. HIGHLY VALUABLE . 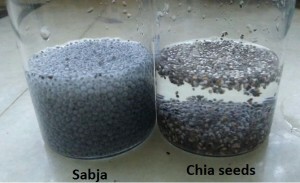 Specially comparitive table is highly appreciated > In the comparitive table why cooling effect of sabja seeds is missing? 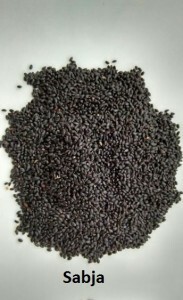 Tukham Malanga which we use mostly in drinks (Sharbat) is CHIA SEEDS or SABJA SEEDS? Very useful info.Where can i find chia seeds in Bangalore?have checked Bigbbazar n few stores but no luck yet. Hi! 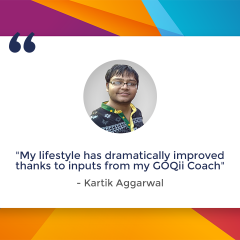 You can order them from the GOQii Health Store within the GOQii app.